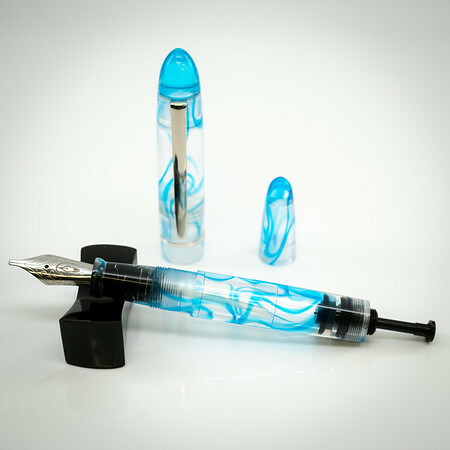 The Extended Mina Level is the result of experimentation with our new translucent materials and a desire to create ways to check ink levels in an Extended Mina without affecting the simple aesthetic of the pen. In addition to seeing your ink level, the pen is symmetrical when capped. Our employee Jake likes to refer to it as a “palindrome pen.” That’s one of the reasons we used the palindrome “level” as the name! 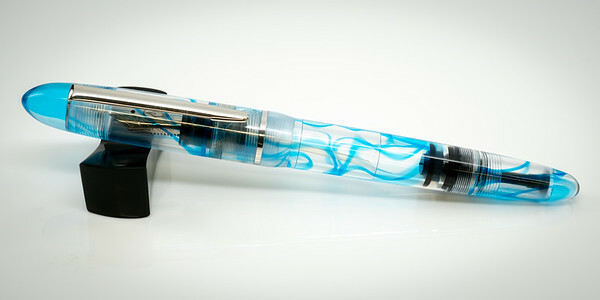 Combined with the fact that it looks like a bubble level and you can check your ink level, it seemed like a no-brainer. One cool feature of this pen is that the design only allows clear portions of the converter to be seen. So this makes the pen appear to be like an Eyedropper or perhaps one of our Draw Fillers. It’s kind of an optical illusion. So this feature allows you to discern ink levels in a converter filling pen that doesn’t look like a converter filling pen. Only the clear portions of the converter are visible, creating an illusion that the pen is an eyedropper filler. With this perfect symmetry, some people might wonder “how do you know which end is the cap and which end is the barrel?” This actually pretty easy. The barrel side of the ink window will be totally seamless. The cap side of the ink window will have a very small .020″ radius that’s only visible if you know what to look for. See towards the end of our YouTube video above for more on this. The “Level” version of the Extended Mina will add $50 to the normal cost. There’s a lot of labor involved in building the ink window, epoxying it into place with an overnight cure, and then the additional boring, sanding and polishing that has to happen to make the interior as nice and shiny as the exterior. So with a Steel nib this pen is $275. With an 18k nib, $375. Here is the Main Gallery for the Extended Mina Level. 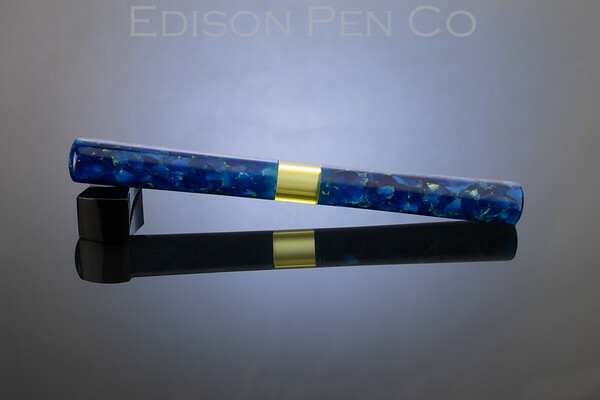 If you are interested in one of these pens that are ready to ship, email brian@edisonpen.com. If you are interested in creating a custom version, reach out and we can discuss! LA Pen Show and Quick Facility Tour! 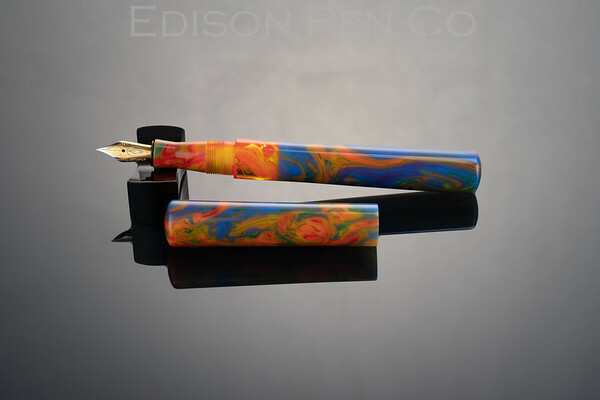 This weekend is the LA Pen Show! Have a look at the video below to see the pens that we’ll be bringing. If you can’t attend the show and see a pen that you like, feel free to email me to see if it’s still available after the show. Additionally, it’s been a while since we’ve done some Behind-the-Scenes videos. Below I’ll give a quick tour of our new facility and new machines. I’ll be following up with a much more thorough video showing our processes and applications when things settle down after the show so stay tuned! We are in the midst of our preparation for the LA Pen Show, which is fast around the corner. In doing so, we have a lot of new pens in our Current Inventory gallery that are ready to ship with no waiting through or normal backlog, which is currently about 10 weeks. You can see more here. Or here’s a direct link to the Current Inventory Gallery. Lastly, I will post a slideshow below showing these pens. 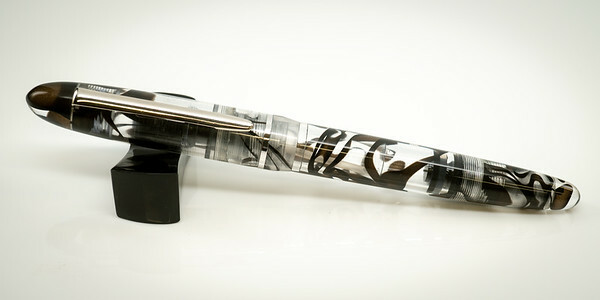 I’ll be posting more updates regarding the LA Pen Show as the date draws closer. We hope to see you there! Happy Holidays From Edison! See you in the New Year! We are wrapping up for the year. If you need my attention I will be working on emails after the New Year. I’d truly like to thank all of our fans and customers for supporting us so that we can continue doing what we love! 2018 saw a lot of new things happen here at Edison, mostly being a lot of new machinery. During the Holiday break, I will get some work done on a nice video blog showing our new facility and machines and will publish as soon as I can. So stay tuned! We are packed and ready for a great weekend at the Ohio Pen Show! We’ve been so busy preparing that I’m afraid that I didn’t have time to put together a video showing what we’ll be bringing, but our inventory is not far off from what we we brought to the Michigan Pen Show a couple of weeks ago. 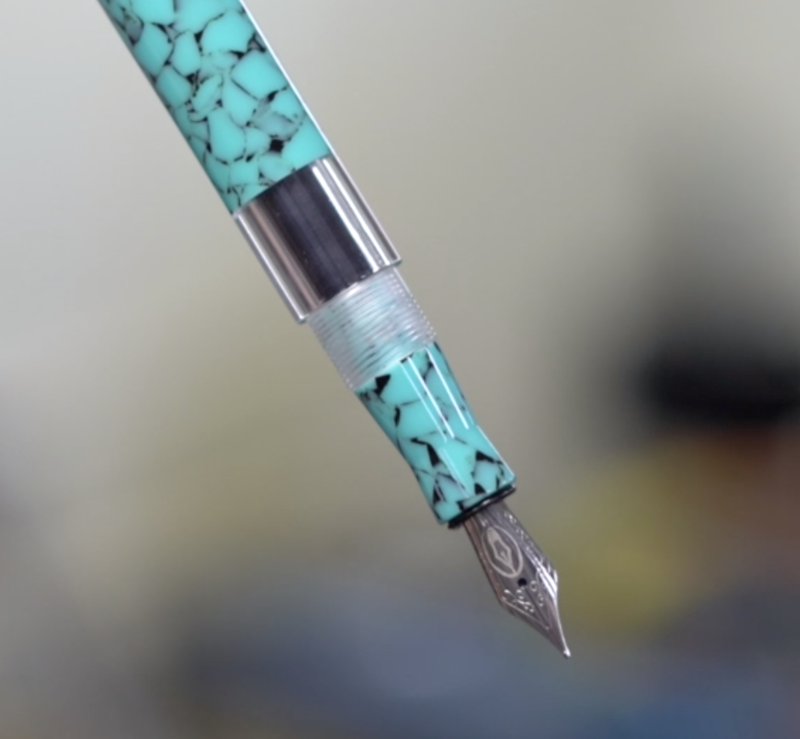 This video will give you a good idea as to the pens that we’ll have with a few exceptions. We’ll be set up Friday, Saturday, and Sunday. 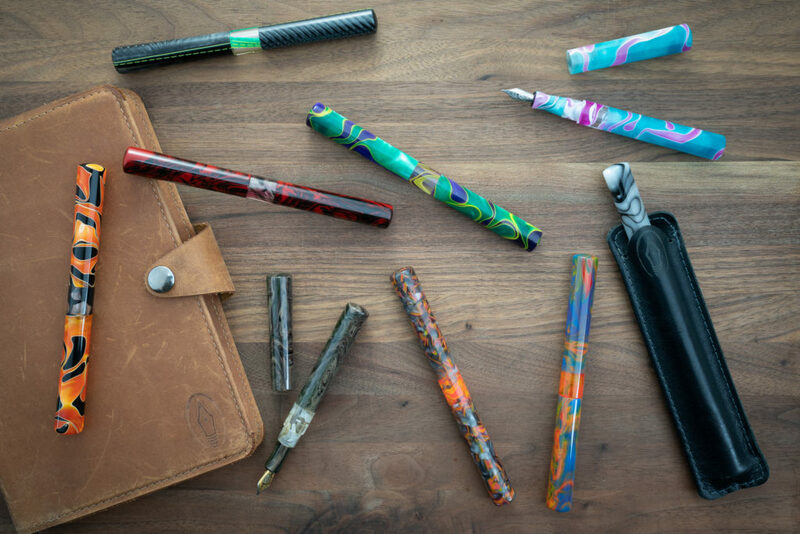 We will be attending the Michigan Pen Show this weekend! See the video below for the inventory that we’ll be bringing. 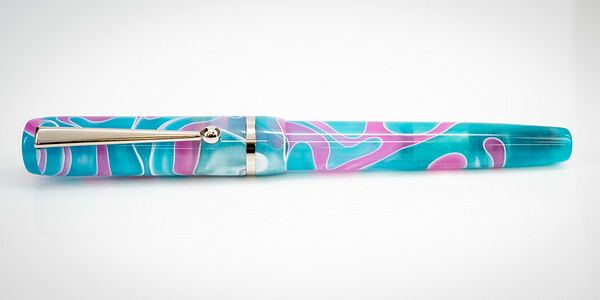 There are a lot of pens that we’ve made in some excellent new translucent materials. If you see a pen in the video that you like but cannot attend the show, feel free to email me to inquire. Stay tuned, as after the Michigan Pen Show, I’ll put together a blog post featuring these new materials that you see in the video. Then in two weeks, we hope to see you at The Ohio Pen Show! I’m happy to announce that we have refreshed the Production Line Beaumont with new materials! All three of these materials are based on fan-favorites. For those of you who like the originals, I see that some of our retailers still have some stocked, but once they are gone, they are gone! So here are the new materials! (if you cannot see the images below, please click here). If you are interested in these new materials, all of our retailers should have received their shipments by now. You can follow this link to see all of the retailers carrying this for purchase. I’ll discuss a little regarding each material. Amber Glass is a material that we’ve used in the past, but only in our Signature Line with the exception of a small limited edition from several years ago. Up until now, we’ve called it Flecked Tortoise. This has been a very popular material within our Signature Line, but the material is pretty expensive. For this reason, it never really lent itself to the price structure of the Production Line. However, with our growth in the last 2-3 years, our volume is getting to the point where we can negotiate larger quantities at a better price, making this material a lot more attainable for us in our Production Line. The material is lightly translucent as you can see by looking at the cap in the top photo. Held up to a stronger light source, you’ll see through this material. It does have some nice pearlization, but the tighter flecked pattern breaks this up. So there is definitely depth, but small “chunks” of depth. Twilight Embers has a base color that is dark, but also with some hints of indigo. The swirls are orange and yellow, making a nice contrast. Some of you might recognize this from our custom line when it was called Elderberry Neon. Of the three materials, Twilight Embers has the most uniform depth and pearlization. This material has been very popular in our Signature line, and I feel that it’s a welcome addition to our Production Line. Unicorn has a pretty interesting backstory, and has been awfully popular in the past. 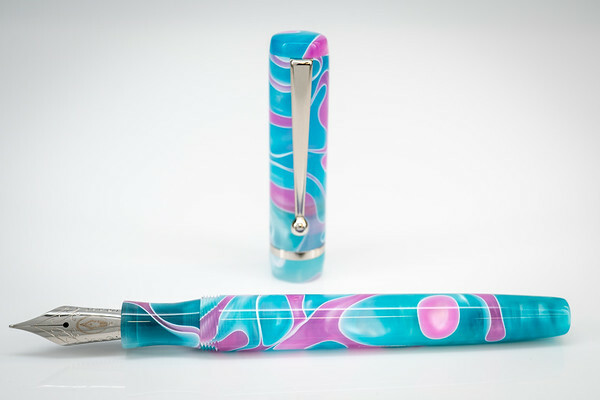 The whole thing started about 4 years when we introduced this as a new material at the DC Pen Show. A customer (@faustine2012) loved it, bought it, and said “this looks like Unicorn Barf!” She hash-tagged this on social media, and as a result the name took off and stuck (even though we had always called it Hawaiian). If you look up #unicornbarfpen on Instagram or social media, you’ll see how popular this moniker has been! 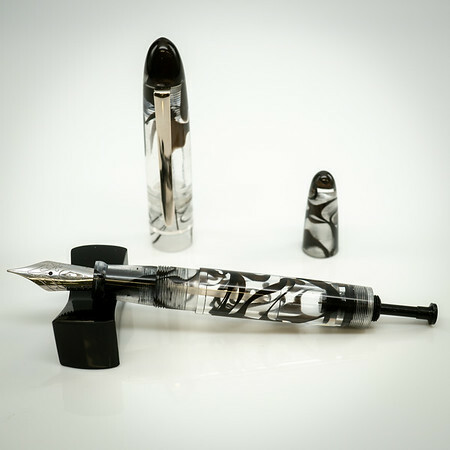 After this, the pen was used in a successful limited edition, and now we are happy to add it to our Production Line. While the slightly outrageous colors speak for themselves, there is also a good amount of depth and pearlization contained within in the blue portions. So these are the new materials! We are considering adding a 4th to this line over time. Let us know what you think would be a good addition, and we’ll certainly consider it! CLICK HERE to find a retailer for purchase. Beaumont Materials Being Discontinued, New Materials Coming! I wanted to make everyone aware that we will be refreshing the materials used in the Production Line Beaumont in a few weeks. We have new materials chosen, and are manufacturing them now. I’ll wait to disclose what those new materials will be, but in the meantime if anyone has been sitting on the fence about a Production Line Beaumont in Bordeaux, Black Onyx, Sapphire, or Bedrock Flake, now is the time! Our inventory closets are completely bare with these original materials, so what’s left at our retailers is it. Just in case you were up in the air regarding these Beaumont materials, they will not be returning to the Production Line. The new materials should be ready to be announced within four weeks, hopefully around three. New Materials and Lots of Updates Coming Soon…. Many of you know that we recently invested in all new machinery, replacing what we’ve been using for the last 10 years or so. With this machinery arriving, my time has been dominated with tons of setup and tooling, but mostly programming. Every program for every part for every pen has to be re-written, de-bugged, and proofed. This has truly been a second full time job for the last 2-3 months. We have been doing 50-60 hour weeks, but it’s actually been fun and rewarding since all of these changes are awfully exciting for us! As a result of being this busy, we’ve admittedly been kind of dark on social media. However, I’m starting to see light at the end of the tunnel and things are coming together. So it’s time to get some announcements out there! 1. We have a LOT of new translucent materials that we’ve never used before. Some of these are just downright stunning. I’m so excited to have them available, especially in the Draw Fillers. Watching the ink slosh around in these pens is just super-cool. If you like translucent materials like I do, you’ll see lots to peruse here. This link shows some of our newest translucent materials, but I’ll be sending an update to showcase all of them soon, so stay tuned. In the meantime, you can see photos below of a few of our new favorites. 2. With this new machinery, I feel that it’s time to raise the curtain again and give an updated “Behind the Scenes” video. We’ve done these in the past, and our fans always love seeing these kinds of videos displaying our processes and equipment. This new video should be very enlightening as we moved to a new and much larger location last year, and this year the new machinery is truly a huge deal for us. So a lot has changed since our previous videos of this type. Expect to see a video tour of our facility and processes in the next few months, as well as some kind of “making-of” video, likely showing how we make our Draw Fillers. 3. This new machinery has already opened up some opportunities within our Production Line, so expect to see an announcement regarding something new in these regards within the next month or so. 4. What’s up for 2019? Well the possibilities for us are a lot wider now, so expect to see more changes, more announcements, and more good stuff as we get settled in! Below are a few examples of some of our favorites from these new translucent materials.